Sugar & Spice Children's Market: Coccinella Eco - Giveaway! I hope you're getting as much joy out of meeting some of our new retailers and friends, and having a chance to WIN some of their wonderful products, as I am. Today I would like to introduce you to this lovely, small and friendly online shop run by Mum, Renata, called Coccinella Eco. Renata began Coccinella Eco after struggling to find natural and eco friendly clothes and toys that were kind to her daughter's very sensitive skin. Through her online store she now imports gorgeous, chemical free goods from her native Poland and surrounds. Head over and have a look through her Coccinella Eco store, as doing so can win you some of her very cute toys! The perfect soft toy for babies and children to hug and adore. 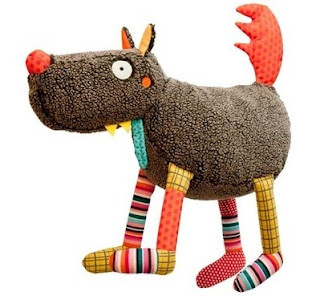 He is huge (around 50cm tall) with a squeaker nose, a jingle bell head and crinkle paper in his legs and tail. A cute and quirky toy just perfect for imaginative play. It is SO easy to enter and like the old cliche goes, you have to be in it to win it! It is also the perfect time for you to meet the lovely Cocinella Eco as it is super sale time for the month of July. 20% discount can be found on some of Renata's favourite brands including; Mon Petit Bebe, Frugi, Kalimba and Bajo. The prize winner will be drawn on July 31 2011 by random generator. Good luck! Entrants must be a resident of Australia. Prize in not transferable. Wow what a lovely online store. Just full of so many beautiful things. The little peruvian poncho is just devine! The kimono sweater is simply gorgeous not only in colour but in the lovely design! i love that the site is so easy to navigate and full of lovely things. i really really love the Kanoe. if i had my time over, i would have gotten one of these with my first baby :) such a brilliant idea! i also showed my boys the toys and they love the dinosaurs and little red riding hood and big bad wolf set. love the skippy kangaroo its fabulous like somuch of their other products. i love the robot soft toy! Oooh!! I LOVE, love, love the Aden and Anais wraps and the Hammocks, what a fantastic idea!! Have now added the store to my internet favorites I love it so much, and its all natural and eco friendly...good on you Renata!! Kind on baby, planet too! Want to buy them all! And those gorgeous Dino Pyjamas, too! I just love the red riding hood and the wolf! Love the site and love the range of eco toys and clothing, all beautiful especially the clothing. Kanoe Hammock (Natural/Khaki), I'd love to see in this myself!